Home » Sermons » What Is Our Identity? Who are we? And how do we identify ourselves? In fact, what would we say is our primary identity in our lives? Which identity do we value most? We’re New Englanders. We’re (or YOU are) Patriots fans. Whether we are Greek Americans, or Albanian Americans, or some other type of Americans, the important thing is we are Americans. We come from a particular family, like the Veronis family. We’re democrats or republicans, and we may identify as conservatives or liberals. And we’d also say we’re Christians, and in fact we are a unique type of Christian, Orthodox Christians. There are many ways to identify ourselves. This past week as we inaugurated our 45th President of the United States, I thought much about our identity as Americans. It’s always something beautiful to see all our past presidents – Carter, Bush, Clinton, and Obama present at the inauguration of a new president. And even if they are from a different political party, it’s so wonderful to see the peaceful transition of power. This is something that makes America so great. I watched the Presidential inauguration, and then I also attended the women’s march in Boston yesterday as a part of my Boston University course. Very different people with very different agendas on these two particular days – the inauguration and the women’s march. I saw people so passionate about their republican or democratic identity, their conservative or liberal identity, and yet ultimately all republicans and democrats are first and foremost Americans! So this made me wonder about which of our many identities we would look at as our primary identity? Which identity should we hold most important and dear? Think about this, because it’s an important question to ask yourself. Which identity in your life in most important and dear to you, one that you would never want to give up no matter what? As followers of Jesus Christ, our identity in Him is supposed to supersede every other identity in our life. Imagine, Jesus even told His followers, “The one who loves father or mother, or son or daughter more than Me is not worthy of Me.” Even our family identity, our own heritage, which is usually our strongest identity, should not take precedence over our identity with Jesus Christ! We see this new revelation of self-identity in today’s Gospel story with the character of Zacchaeus. Zacchaeus would have self-identified as a Jew, as a tax-collector, and as a very rich and important person. That was his self-identity. And yet, after he encounters Jesus and welcomes Him into his home; after he encounters the love and mercy of Christ and tastes the salvation that Jesus offered even him as a terrible, corrupt sinner, Zacchaeus sees himself as a new person. And as a new person, he receives a new identity. He then goes on to show what this new identity in Christ means to him when he says, “Half my goods I give to the poor, and if I have cheated anyone, I will repay them fourfold.” Someone who experiences such a radical change in their life surely will see their central and primary identity as a follower of Jesus Christ. And Zacchaeus is only one example we can look at. Throughout the month of January, we especially highlight a number of the greatest of the desert father and ascetics. These were men and women who understood so well their identity in Christ that they were willing to give up everything for the treasure of faith. St Seraphim of Sarov went into the Russian forest to seek union with God, even staying on top of a pillar of stone for 1000 days in a row, all as a means of communing and encountering God. 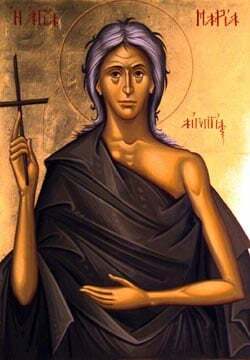 Paul of Thebes and John the Hut Dweller were two other great ascetics we remembered last Sunday, men who lived what seemed like foolish lives to the world, and yet they offered their extreme asceticism all for Christ. And this past week we remembered St. Anthony the Great, the father of monasticism who lived for 70 years in the Egyptian desert, St Athanasios the Great who stood up against the entire world when it had fallen into error, as well as Makarios the Great, Euthymios the Great, Maximos the Confessor, along with St. Isaac and St. Ephraim the Syrians who all lived radical lives in extreme asceticism, yet all for a purpose. Each of these saints understood their primary identity not as a Roman citizen, not as a Russian, or an Egyptian, or a Greek, but as a child of God, and a follower of Jesus Christ. This trumped all else in their lives! This identity came first and foremost, before everything else in their lives. These great saintly figures remind us that our citizenship is not of this world, our primary identity is not of any nation or people or family or political party. We all are first and foremost children of God who can choose to live under His reign, to live in His kingdom here and now. This reign of God gives us a new perspective and worldview that we may choose to live under – living with a perspective of love and mercy, grace and forgiveness, beauty and goodness, truth and righteousness. Living under the reign of God as a child of God means we always keep our hope in Him and His perspective, not on politics or world events. No matter how dark our politicians portray the world we live in, we know that as Christians, we live in a world where God is ultimately in control. And we are assured of His love for us, as we hold on to His promise that we are His children created in the palm of His hand. Who are we, and what is our primary identity? Let us each remember and try to live out the fact that we are first and foremost Orthodox Christians and children of God!